Tomato wine vinegar was a successful experiment. Ron hand selected the tomatoes and in the usual process, which lasts at least a couple of months, turned them into tomato wine. I wouldn't say it was gourmet quality, though like many wines, it maybe would have become an acquired taste. But Ron didn't leave it at the wine stage. He put the vinegar starter in and set it up for a slow wait to see how tomato wine tasted as vinegar. Tomato wine vinegar is pretty good. It was ready (has to be at least 5% acidity) about the time we had a good supply of basil in the herb garden. Of course basil and tomatoes are classic pairings, like dill and pickles, like Ozzie and Harriet, like Ben and Jerry. Well, something like that anyway. With the thick row of prime-for-picking basil, Ron immediately infused the tomato vinegar with lots of fresh basil. I say "immediately" but that part of the process takes another two weeks. When the basil/tomato vinegar was ready, we tasted and were blown away by the intense flavors. We immediately (not after two weeks) knew this would be special on anything with tomatoes: fresh tomato salsa, on salads, sprinkled on pizza, simmered into spaghetti sauce. 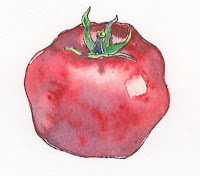 The Leatherwood Basil in Tomato Wine Vinegar has been a hit and now, in 2013, it deserves a new label: a fresh beautiful watercolor tomato. Some have asked if we sell just the tomato wine vinegar. We haven't yet since all of it has been infused with basil. We need a lot to meet the demand. But, maybe, if the tomato crop is good this year...we'll see.